Update 2006: This software is very old and no longer maintained. Don't use it. 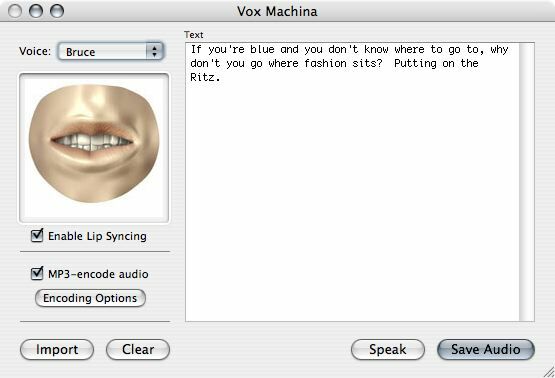 Vox Machina is a speech synthesizer program for Mac OS X. It utilizes Apple's Speech Synthesizer technology, which enables it to speak text out loud and save spoken text as audio files (either uncompressed AIFF or MP3-encoded audio). Vox Machina also sports a lip-syncing feature where the relevant lip and mouth movements corresponding to spoken phonemes are displayed as a series of images. Vox Machina is primarily intended for entertainment, but it can be useful for creating spoken audio to listen to later (e.g. on an iPod). Vox Machina is free, open-source GPL'd software. The latest version is Vox Machina 1.1. It requires MacOS X 10.3.9 or later in order to run, and is provided as a Universal Binary.